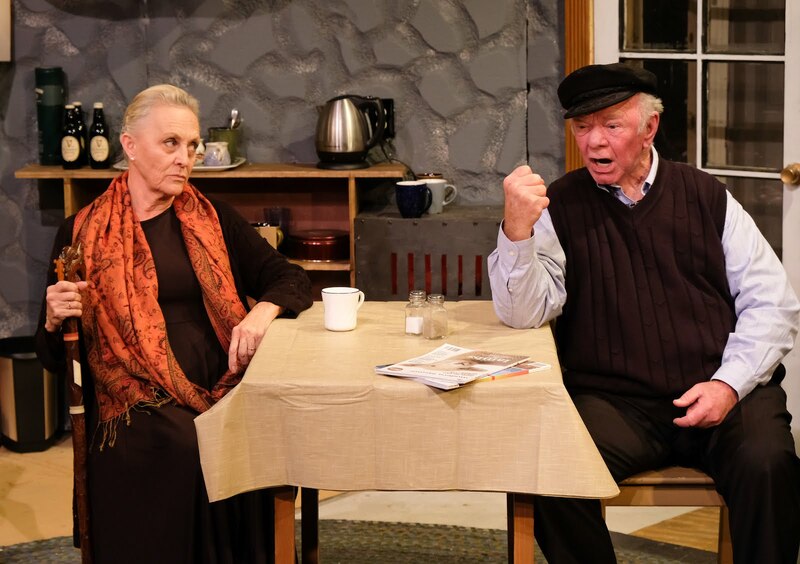 Carol's Theatre Reviews ~ It's Fun To Go Out: “Outside Mullingar” A Sentimental Journey at Scripps Ranch Theatre. 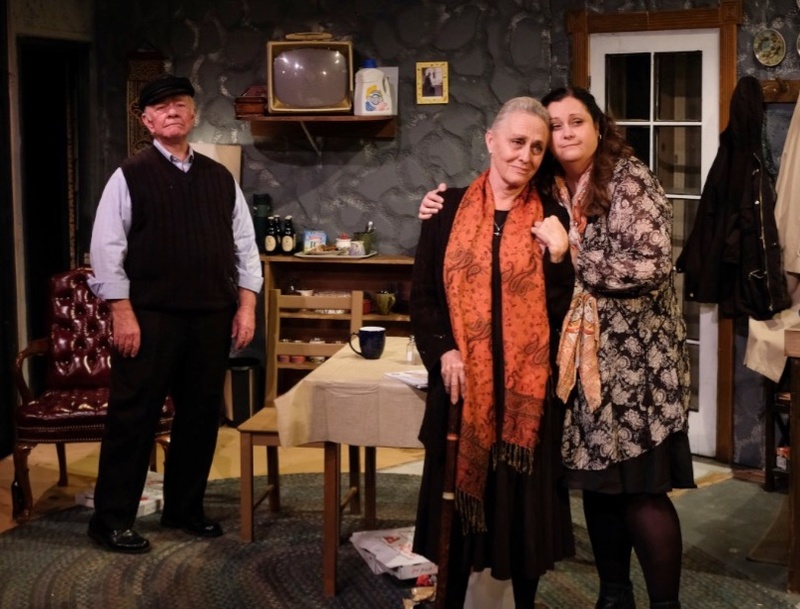 “Outside Mullingar” A Sentimental Journey at Scripps Ranch Theatre. Sound sentimental? Well, I am sentimental and as I get older, the more sentimental I get. That’s why “Outside Mullingar” hit some nerves as I sat and watched two lonely young people struggle to gain their footing in a world that talks love and relationships, sings its praises but for them it’s an a uphill journey, or downhill as the song indicates. In my long ago memory, Tommy Edwards 1951 recording “Morning Side of the Mountain” stuck with me over the years. It has just enough pathos to bring tears of frustration and just enough foresight to bring smiles of hope. That’s exactly the way John Patrick Shanley’s “Outside Mullingar struck me. 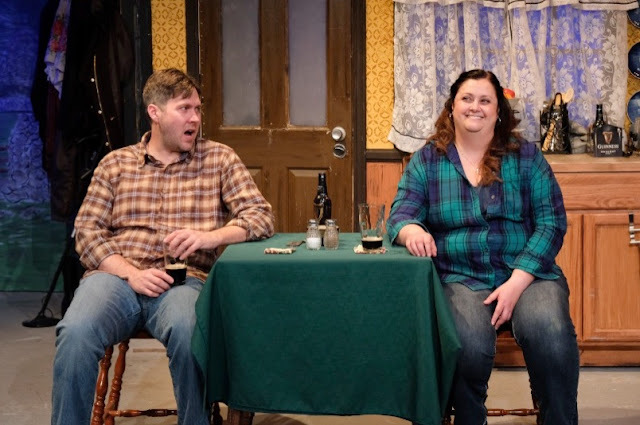 Scripps Ranch Theatre is mounting a beautifully subtle and finely acted bit of romantic comedy in Shanley’s “Outside Mullingar”. Under the watchful eye of Kathy Brombacher’s direction ‘Mullingar’ enchants. It stars Jim Chovick, Stephen Schmitz, Dagmar Fields and Vanessa Dinning. Tony and Aoife (Chovick and Fields) have been neighbors, it seems forever. They live in a rural village just outside Mullingar not far from Dublin, but it seems a world away. After the death of her husband we find Aoife and Tony deep in conversation in Tony’s kitchen (Bob Shuttleworth). The conversation veers to rumors that Tony is not going to give his only son Anthony his farm after he dies, which he’s sure will be soon. He’s considering a nephew in America as the recipient of his family farm. By this time Rosemary has come to house and both mother and daughter fall on Tony until he comes to his senses and agrees Anthony should have the farm after all. The two families own adjoining farms with a gate separating them. Years ago when Tony needed some cash he sold off a small parcel to Aoife’s husband that was deeded to Rosemary when she was a child. Tony wants it back but that’s a non- starter. The land will remain in Rosemary’s column. It’s not surprising then, that there were no secrets between the four nor is there now between the two since each lost their surviving parent. The only unspoken secret is why the two have been dancing their separate dances, for years. Why they don’t decide to get hitched is the mystery that we all hope will be resolved at plays end. Certainly there is chemistry, history and it just makes sense. To say that their secret longings have been brewing under the surface for years would be an understatement especially for Rosemary. Anthony even had a serious girlfriend at one time and she weathered that storm. Now a year has passed and both sets parents on each side are deceased. For Rosemary, her patience is running out. Anthony has his own inner demons that we will learn later rather than sooner, so listen up. Some will amuse, some astonish and others, just plain fear, pure and simple. But Shanley’s “Outside Mullingar” isn’t that simple. Its really about two displaced (just about past prime time) who must take this journey to find love or whatever they imagine love would look like. It’s epic in proportion, as we will soon find, as the entire second act is their coming of age relationship. 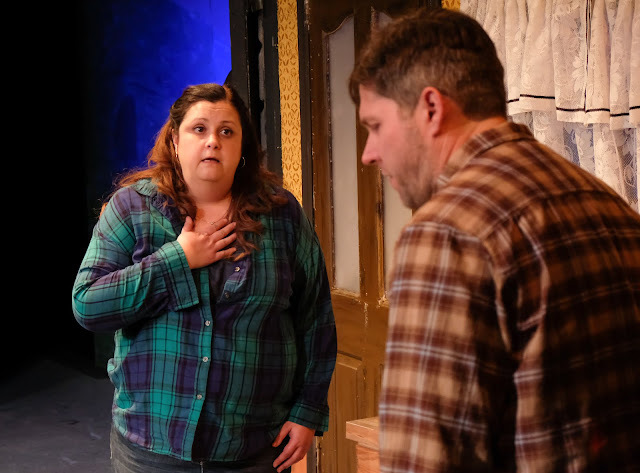 Between Shanley’s lyrical dialogue, and a terrific cast supporting that, we find ourselves in the middle of some strange bargaining or fact finding; is he gay, impotent, depressed? The fact that she loves him so, she’s willing to explore every angle. His retorts are one for the books and that’s what makes this love story so charming, so truthfully sad, so appealing…so Irish. It’s as if they do live on opposite sides of the mountain; the dark side and the lighter side. Putting shy and almost childlike Anthony up against outgoing, speak your mind Rosemary doesn’t seem ‘fair and balanced’ but in Shanley’s world and you will agree it is indeed balanced. New York born Irish –American, Shanley of “Doubt” (Pulitzer Prize) and “Moonstruck” (Best original Screenplay) “Danny and the Deep Blue Sea” knows how to tell story and build it to awesome heights while keeping us in suspense as to the outcome. Both Chovick and Fields make a convincing and natural case for themselves as Tony and Aoife. Chovick so cockeyed sure of himself is a pleasure to watch sputtering and spouting as a know it all. Fields is solid on her own. She adds levity, truth and strength as Aoife. Her facial expressions are in a league of their own. Stephen Schmitz, who was so wonderful as the father of a severely autistic son in InnerMission’s “Falling” does not disappoint as Anthony even though it’s a completely different world he now occupies. His every move and gesture is in anticipation of the next round. He’s as funny as he is dead serious as he inhabits Shanley’s words. The prize of this production goes to Vanessa Dinning’ Rosemary as she leads Anthony on a path to reality giving him every reason and chance to either accept her as she is, letting her love him as deeply as she knows how or giving him the option to walk away. She bares her soul, her love and is ready to give him her heart. It’s a gift, a love story and a winning production. 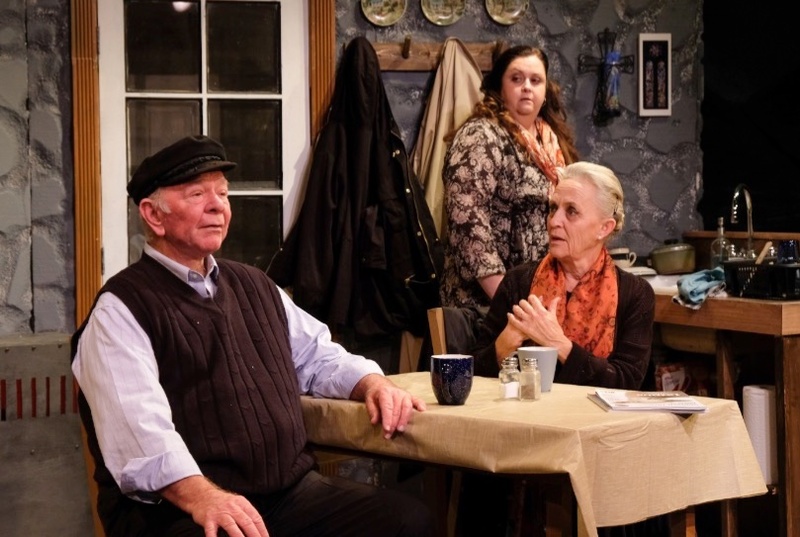 Venue: Legier Benbough Theatre through Feb 18th/ Brooks Theatre.